Why ever did I decide to read a book about rain? It's not as if there isn't enough rain already where I live (although there's said to be extreme drought in my region compared to other years, I've seemed to have failed to notice this change). However, it turned out to be a very good decision since it was a very interesting take on not only rain in its many forms but many aspects of culture as well. Human civilization has been inseparable from rain, as is also suggested in the first chapters, where drought is given as a possible but likely reason for the ending of early civilizations. And indeed, have humans not tried since these early times to manipulate the weather, by appeasing Gods or changing the routes of rivers? (The chapter on the weather magician is particularly interesting). But there are also chapters on raincoats, traditional Japanese umbrellas and many more things. Or how about rain in music? Since the books focusses on so many different aspects that are connected to rain (this is much more than a simple guide on how rain develops; although I might have liked to read a bit more about weather science) I believe it will have something that interests everyone. It's only logical that some pieces interested me more than others, but none of the chapters were too long, so this didn't bother me. Near the end of the book I did feel like the connection to the rain topic became a little bit less clear, but I still enjoyed it. 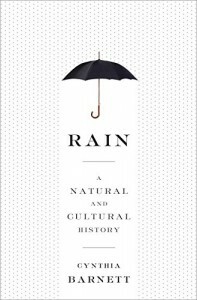 An interesting read and definitely a natural and cultural history of rain! Thanks to Blogging for Books for providing me with a free copy of this book in exchange for an honest review!